Think of Level 1 Data as “business card information” data that provides answers to the “Who is Who” question. The corresponding data format: LEI-CDF version 1 (also called LEI Data File Format 1.0) has been developed and introduced by LEI ROC since August 2014. LEI-CDF is an XML file format and its structure is dictated by the XML Schema document (https://www.gleif.org/_documents/lei-data-file-format.xsd). In November 2016, GLEIF published LEI-CDF version 2.0 of the format (LEI Data File Format 2.0). The main objective of the update was to respond to the reflections of LOUs regarding the registration processes that have been aggregated since its inception, and to also overcome some of the observed difficulties with the collection of “who is who” type reference data. Half a year later, in May 2017, GLEIF published the next update of the LEI-CDF format (LEI Data File Format 2.1), that contained a consortium of corrections (bug fixes, a new element, change of constrains, and some minor documentation changes). In principle, whilst the data model is already defined, it can be expressed in a range of different file formats. The canonical file format for LEI CDF is XML and is defined in the respective XML Schema (see below). 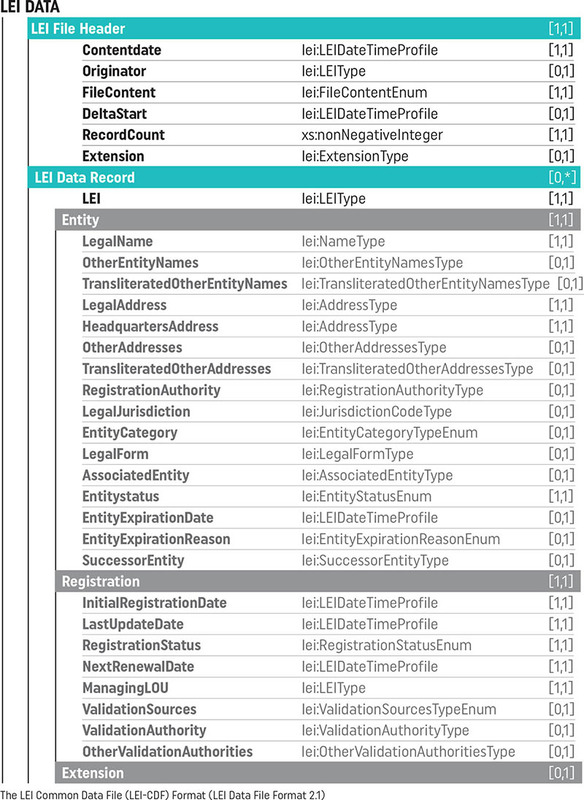 The XML Schema document for the LEI Data File Format 2.1 is available here. The documentation of Format 2.1 is available here.